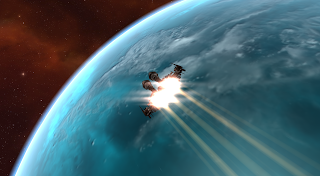 One of the nicest things about Eve is that it can be played on a regular computer. Top of the line gaming machines are not needed to enjoy Eve. However, they are nice to have. A laptop can run the game and one can still enjoy the game. There is an interesting lack of hardware snobbery. Rubicon integrated DirexctX 11 into the Eve client. My graphics abilities proceeded to fall into the toilet. My almost four year old video card could no longer keep up. Irritated, I've been debating dropping back down to DirectX 9. If anyone missed the Dev Blog about the DirectX changes and have wondered why their graphics cards are weeping electronic tears, read it. When I first started playing, I could have my clients all on maximum settings. After Crucible 1.1 hit I could only run two on maximum settings and the rest had to be on 'performance'. That wasn't a major thing. Sugar was always in high resolution so that I could enjoy my space battles and take beautiful pictures as I flew around. My graphics card is an AMD Radeon HD 5800. I've loved this card and it has treated me well over the years. I am often playing another game with one or more Eve clients up and a web browser. I also as my machine to support multiple monitors. So, my husband, finishing his new uber watercooled computer upgrade project handed me his older machine which is two years newer than mine and ordered me a new graphics card. Let me say that I did not complain. Not a bit. I somehow managed to gracefully sequel and bounce around the room while gibbering in excitement. My new card is an AMD Radion HD 7870 GHZ. It is not his R9290X but I do think there is a limit to how high our electricity bill should soar. I have no complaints. I can now run all of my clients on full high quality resolution with no shuddering and framer ate issues. I am thrilled. However, fate was not to be kind! For UPS said they had it out for delivery and as the hours ticked away and my step remained empty I started to despair. Then, they updated their website and sent us a mail saying, "Sorry we couldn't get it out to you today." The first world problem tears leaked from my eyes. The acquisition of my new card could not have come at a better time. I find it frustrating to have a game as pretty as Eve and not be able to view it that way. Since the directX updates I have had stuttering and freezes. I've had invisible spaceships and if I scroll out about three clicks of the mouse wheel my ship becomes a blurred blob with graphics cut down to performance where before it'd not be the prettiest thing but it'd have some structure to it. Vov once said, "I wish they had a graphics on minimal setting. Just polygons." I didn't understand that desire at the time. But, after cutting down my graphics it made more sense. Most of us play scrolled out far enough that we don't see our ships. Multiboxing is a fact of most players lives. If one is going to go for performance they should be able to go for very raw performance. In some ways I feel that CCP is trying to drag us kicking and screaming back into Eve the game. I'm not sure if it is intentional or a side effect of their accessibility goals. Things like the sound changes for gates for instance almost force people to listen where they never did before. I don't think it is bad insofar as that it is something that is. The warp tunnel effect may be one of the most striking points. "How do you turn it off?" someone just returned to the game said the other day. "You don't," was the resigned sigh across coms. "CCP has said we have to deal." And while it is CCP's game there is still a disappointed resignation. Just as I ask myself, every time I slip into one of my Cynabals why someone decided to put a bright red light on the ships nose. It is one of the most ridiculous things I have ever seen. I love Eve's graphics. I have hundreds of pictures from the game. My blogs background and title come from in game shots. I spend time spinning and warping and catching the angles of the sun. I think the game is gorgeous and I am glad that CCP puts time and energy into it (even if the Jaguar lost its sparkle it just gained in this latest update). But, Eve is more then the game of Eve as silly as that may sound. CCP Explorer once commented that a certain player's game of Eve was played not logged in and that wasn't a bad thing. It was how they played Eve. As much as I am wallowing in full graphics across all of my accounts I think that a reminder for those who have limited graphical abilities or desires should also be considered when these new and beautiful things are done. But, pretty, pretty, pretty! It is a game that is featured in the Museum of Modern Art because it is decadent in its visual brilliance.